Open your room up by enhancing the natural light with this large landscape mirror. A thick beveled edge gives the mirror a polished look that is unparalleled. 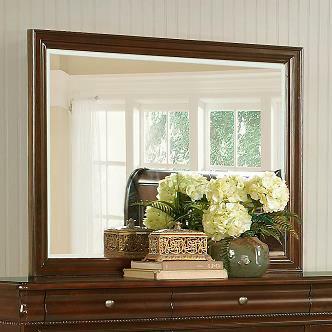 Framed by select veneers and solids this mirror has been bathed in a warm cherry finish to complete the timeless and elegant style. The C4116A Traditional Beveled Landscape Mirror by Lifestyle at Furniture Fair - North Carolina in the Jacksonville, Greenville, Goldsboro, New Bern, Rocky Mount, Wilmington NC area. Product availability may vary. Contact us for the most current availability on this product. Create a master suite you can be proud of with this traditional bedroom collection. Each piece is expertly crafted from select veneers and solids and has been bathed in a rich cherry finish for a timeless feel. 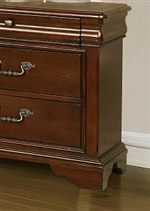 Adorning storage drawers are antiqued looking brass colored knobs and pulls to add to the classic appeal. 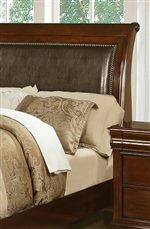 Stacked mouldings, rich brown upholstered headboards with nailhead trim and sleigh silhouettes all combine to give your room a traditional yet modern look. The C4116A collection is a great option if you are looking for Traditional furniture in the Jacksonville, Greenville, Goldsboro, New Bern, Rocky Mount, Wilmington NC area. Browse other items in the C4116A collection from Furniture Fair - North Carolina in the Jacksonville, Greenville, Goldsboro, New Bern, Rocky Mount, Wilmington NC area.